Osteoarthritis is a disorder that occurs when the cartilage that cushions aging joints wears away over time. The bones then rub together causing pain and stiffness. Bone spurs can form around the joint and nearby ligaments causing muscles to become weakened and stiff. Most cases of Osteoarthritis in Broward County are found in older patients; however, there are medical conditions that can also bring it on. These conditions include hemophilia, avascular necrosis, gout, pseudogout, or Rheumatoid Arthritis. While most people experience some symptoms of Osteoarthritis as they reach old age, some experience it sooner and more severely. The disorder seems to run in families, but other factors can also increase the risk, such as obesity, physically demanding jobs, high-impact sports, and certain injuries to bones, joints, ligaments, or cartilage earlier in life. If you suspect you may have Osteoarthritis, you should seek out doctors who specialize in Osteoarthritis in Broward County. Dr. Charles Kahn, Dr. Wayne Riskin and Dr. Yesenia Santago-Casas are the first and leading rheumatologist in the treatment of Osteoarthritis in Hollywood and Pembroke Pines. They will look for symptoms such as pain and stiffness in the joints, grating or crackling noises when the joint is moved, and morning stiffness. They will perform an exam to check for these signs as well as a limited range of motion and joint swelling. They may also use an x-ray to look for the loss of joint space, worn down bones, and bone spurs. 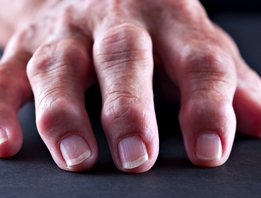 Osteoarthritis cannot be cured, but the symptoms can be somewhat controlled. Drs. Kahn, Riskin and Santiago-Casas may prescribe medications such as cortocosteroids, or artificial joint fluid. For minor symptoms they may simply put you on a regimen of acetaminophen or ibuprofen. They will also likely recommend lifestyle changes such as low-impact exercise, the application of heat and cold, a nutritious diet, rest, protecting your joints, and losing weight if necessary. They can also recommend physical therapy, braces, and in severe cases, surgery to replace or repair damaged joints. If you are suffering from Osteoarthritis in Pembroke Pines or Hollywood, Dr. Charles Kahn, Dr. Wayne Riskin and Dr. Yesenia Santiago-Casas will discuss with you which treatment options would work best to alleviate your pain.